Mr Sokoun Chanpreda is CEO of HMD Asia, a market leader in developing up-scale boutique hotels, destination restaurants and clubs. 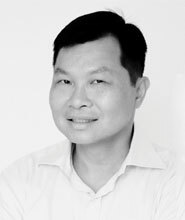 Mr Sokoun’s trendy and eco-friendly resort designs have won him several awards, including: “Best Large Hotel” for Hotel de la Paix in Cambodia; and “Best Poverty Reduction” for Shinta Mani hotel designs in the Greater Mekong Sub-region, and is multi-award-winning developer of Bangkok’s iconic Bed Supper Club. He has also received the “Best Overseas Tourism Award” from the British Guild of Travel Writers, plus “Sustainable Hotel Award” from the Hotel Investment Conference Asia Pacific (HICAP). Travel + Leisure 2014 Global Vision Awards selected Shinta Mani Club & Resort as the Runner Up in the Community category, for “involving locals at their very core, creating experiences for travelers that are all the more extraordinary. In the November issue of Conde Nast Traveler, America’s other leading travel publication, The Readers’ Choice Awards 2014 ranked Shinta Mani Club among the Top 25 Hotels in Asia. Shinta Mani has added to their already impressive list of accolades with being awarded as #3 on the global Travellers’ Choice List of World’s Best Hotels presented by TripAdvisor, one of the world’s largest and most influential travel websites. Mr Chanpreda has also provided full technical service to the re-development of Indigo Pearl in Phuket and opened the famous Thai restaurant, Long Table of Bangkok. Mr Sokun is also President and volunteer worker for HOPE Worldwide (Cambodia). He was educated and raised in Bangkok with roots in Cambodia and has received his BA education at Boston University. His experience extends to high-end jewelry and hotel property development.